STS Contracts have many year’s experience in powder coating. With their unique blend of experience, flexibility and large modern capacity, STS Contracts continues to break new ground with a broad range of specialist solutions. 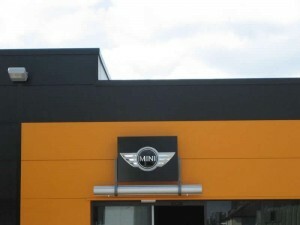 Powder coating is perfect for any finish where appearance and / or durability are important factors. Applications include indoor and outdoor signage, railings, balconies, balustrades, engineering components, security shutters and security gates. All powder coating can be customised to meet YOUR exact requirements and specification. All powder coating is carried out in their own powder coating plant and they are able to provide a national powder coating service. Speed – Nearly all wet paint systems require more than one coat, but all wet paint systems take a long time to dry. One powder coating (90 microns) is equivalent to nearly 5 coats of wet paint (20 microns) saving time and money. Environmentally friendly – Powder coating does not rely on the use of solvents and does not generate odours during the curing process. Anti-corrosion – Wet paints can be diluted with solvents. Powder coating is a solid film, offering a more watertight shield. Durability – The most popular resin used for powder coatings is polyester. Polyester is tough and flexible. Consistent quality finish – The product is powder coated and only when complete is it heat-treated to melt the powder to a liquid. This prevents over spray and ensures a smooth finish unlike wet paint applications.